Introduction: Oral submucous fibrosis (OSMF) is a chronic debilitating disease and a premalignant condition of the oral cavity characterized by generalized submucosal fibrosis with a multifactorial etiology. Myofibroblasts are a unique group of cells phenotypically intermediate between smooth muscle cells and fibroblast exhibiting contractile properties, expressing α-smooth muscle actin (α-SMA) and are considered primary producers of extracellular matrix after injury. Their accumulation has been established as a marker of progressive fibrosis in various organs. The aim of the present study is to evaluate and compare the myofibroblasts in various histological grades of OSMF. 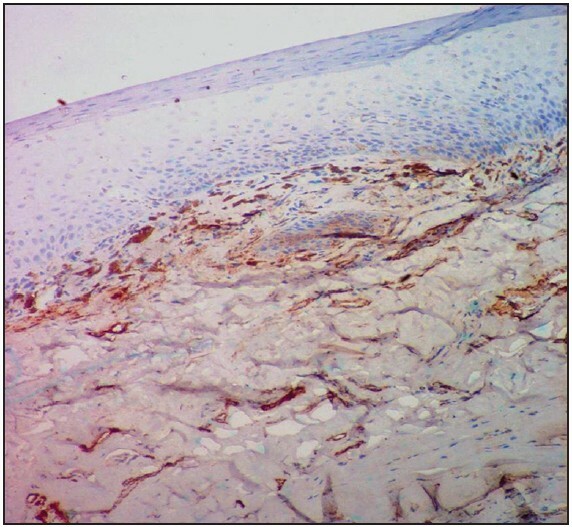 Materials and Method: Fifteen cases of OSMF, which were further categorized histologically into early (5 cases), moderately advanced (5 cases) and advanced (5 cases), were subjected to immunohistochemical evaluation using α-SMA antibody for detection of myofibroblasts. Fifteen benign mucosal proliferation specimens were also stained for comparison. Results: The number of myofibroblasts in OSMF was significantly increased when compared to that of benign mucosal proliferations (P < 0.05). Additionally, a statistically significant increase in the myofibroblasts population between early and advanced stages was observed (P < 0.05). Conclusions: The results of the present study showed that expression of myofibroblasts within the OSMF group showed a progressive increase from the early OSMF through moderate OSMF and the advanced OSMF group indicating that myofibroblasts could serve as effective prognostic marker for disease progression in oral submucous fibrosis. Worldwide estimates in 1996 indicated that 2.5 million people were affected by the disease. In 2002, the statistics for OSMF from the Indian continent alone was about 5 million people (0.5% of the population of India). Recent epidemiological data indicate that the number of cases of OSMF have risen rapidly in India from an estimated 250,000 cases in 1980 to 14 million cases in 2010. This has led to the fact that OSMF to be now globally accepted as an Indian disease. The reasons for the rapid increase of the disease are reported to be due to an upsurge in the popularity of commercially prepared areca nut preparations (pan masala) in India and an increased uptake of this habit by young people due to easy access, effective price changes, and marketing strategies. Myofibroblasts are a unique group of cells phenotypically intermediate between smooth muscle cells and fibroblast or more commonly referred to as phenotypically altered fibroblasts, take part in physiological tissue repair (wound healing) and disappear after healing by apoptosis. But when there is continued insult, these myofibroblasts persist in the tissue and result in dysfunctional repair mechanisms causing excessive secretion of ECM with resultant fibrosis and scarring. This has been established as a marker of progressive fibrosis in organs such as liver, lungs, kidney, and skin. These myofibroblasts can be identified by certain characteristic features of the cytoskeleton, particularly by the expression of α-smooth muscle actin (SMA), and are believed to be primary producers of ECM after injury. Currently, only limited studies exist to elucidate the presence and role of myofibroblasts in OSMF and OSMF being a chronic scarring disease and a known premalignant condition, this study is aimed to evaluate the presence of myofibroblasts in various histological grades of OSMF using α-SMA antibody and to know if myofibroblasts could be used as a marker to evaluate disease progression. This laboratory-based immunohistochemical study involved the use of buffered formalin fixed, paraffin embedded tissues of previously diagnosed cases of OSMF and oral mucosal proliferations, with each category consisting 15 samples. The samples were reviewed, and findings on hematoxylin and eosin staining were recorded. The OSMF cases were further subdivided histopathologically into early, moderately advanced and advanced according to Pindborg and Sirsat  with each category consisting of five cases. 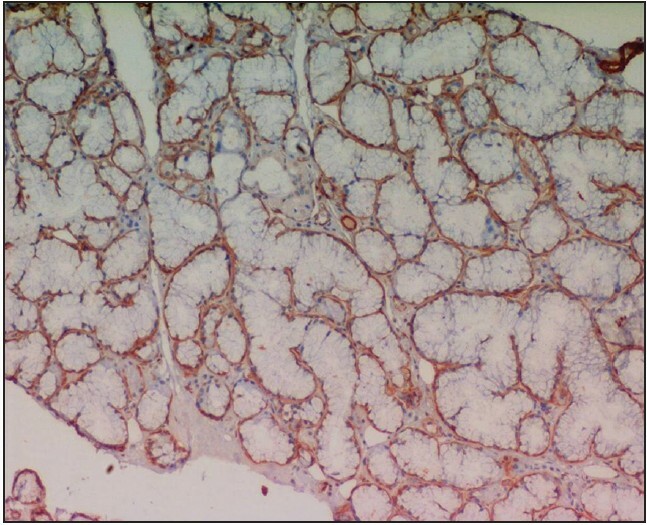 Immunohistochemical procedure was carried out using NovoLink™ Novocastra™ polymer detection system and ready-to-use mouse monoclonal α-SMA (Leica Biosystems Newcastle Ltd, UK. Lot No. 6020842). Stromal spindle cells positive for α-SMA were regarded as myofibroblasts. The immunostaining for α-SMA was performed in a two-step process that involved the demonstration of antigens in tissues and cells first, by the binding of an antibody to the antigen of interest, followed by detection and visualization of the bound antibody by an enzyme chromogenic system. To evaluate the specificity of the immunoreactions, known positive and negative tissue controls were used. Immunostaining was assessed by the evaluation of the staining intensity and percentage of α-SMA positive cells, according to the method used by Etemad-Moghadam et al. The staining percentage was scored as 0 = no positive cells, 1 = 1-33% positive cells, 2 = 34-66% positive cells, 3 = 67-100% positive cells. Staining intensity scoring was recorded as 0 = no staining, 1 = in parts where positivity was observed only at a magnification of ×400, 2 = in cases where the staining was obvious at ×100, but not at ×40, 3 = in fields where immunopositive cells were seen even at ×40. The immunopositive cells in the noninflammatory and nonendothelial stromal cells in the subepithelial connective tissue of OSMF were recorded for the percentage of positive cells and the intensity of staining. Multiplication of the percentage and intensity scores comprised the staining index of each specimen. The staining index was recorded as zero (0), low (1, 2), moderate (3, 4), high (6-9). All the sections were evaluated by two observers to eliminate interobserver bias. The differences in the presence of myofibroblasts in different groups were analyzed using the Chi-square test, and Fisher's exact test was done to compare staining index of α-SMA between and within the groups. A P < 0.05 was considered statistically significant. A positive reaction for α-SMA was observed. Salivary glandular tissue that served as a positive control exhibited intense positivity for α-SMA [Figure 1]. The number of α-SMA-stained myofibroblasts in OSMF was significantly increased when compared to that of the benign mucosal proliferations (P < 0.05) [Table 1] and [Figure 2]. In addition, a statistically significant increase in the myofibroblasts population between early and advanced grades was observed (P < 0.05). However, comparison between the moderate and the advanced OSMF groups, the pattern of expression was not found to be statistically significant [Table 2]. Oral submucous fibrosis is a high-risk precancerous condition, characterized by changes in the connective tissue fibers of the lamina propria and deeper parts leading to stiffness of the mucosa and restricted mouth opening. Fibrosis is a progressive disease characterized by accumulation of ECM proteins, which disrupt normal tissue architecture  and OSMF is one such disorder characterized by exuberant deposition of subepithelial collagen in response to chronic areca nut chewing resulting in mucosal rigidity that leads to limitation in mouth opening. According to studies in various fibrotic disorders, the key cellular mediator of fibrosis is myofibroblasts, which when activated serves as the primary collagen-producing cell. These cells can be occasionally found in normal tissues, but increased numbers of myofibroblasts appear during wound-healing process. After tissue injury, the myofibroblasts are involved in healing and creating granulation tissue. They produce numerous inflammatory mediators, chemokines, growth factors, and ECM proteins like collagen, fibronectin, etc., which results in ECM reorganization. In addition, they are also important in contraction of ECM because of their component of α-SMA and thus aid in tissue contraction. Several studies have shown that the microenvironment or stroma of neoplastic tissues plays an active role in tumor progression. Concurrent with the conversion of nondiseased epithelial tissue to precancerous epithelium to carcinoma, the stroma also changes from normal to primed to activated or tumor associated. In this regard Albini and Sporn  have even suggested a revision of the nomenclature of malignant epithelial tumors. Accordingly, the altered epithelial cells of OSCC would not be solely responsible for carcinogenesis, but different stromal factors participate in its development via communication with the epithelial elements. Fibroblasts are considered as one of the most important mesenchymal cells involved in tumor progression. Transdifferentiation of fibroblasts to myofibroblasts is a crucial and early event in tumorigenesis. The localization of myofibroblasts among the study group was varied and was present in the stroma only subjacent to the epithelium in few cases, and few cases showed scattered presence all over the stroma. This feature as explained by fact that the myofibroblasts that are present in the stroma are basically present in two dominant patterns, "spindle" and "network," as described by Vered et al., and Kellermann et al., , In the "network" pattern, myofibroblasts are exceptionally abundant and occupy almost the entire tumor stroma, while the "spindle" pattern is characterized by stromal myofibroblasts that have spindle-shaped morphology and are located at the periphery. Consequently, it appears that altered tissue microenvironment, elicited by wounding and fibrosis, significantly increases the risk of tumor incidence and progression. Correlating this to OSMF, the possibility of epithelial-mesenchymal interactions resulting in altered keratinocyte phenotype predisposing to the development of malignancy in OSMF has been reported. This possible role of the myofibroblast in malignant transformation of OSMF requires illumination with further research. A major issue in this study is that there was no way of knowing whether the examined OSMF cases would have transformed into OSCCs or remained as such. Another problem was that we were unable to obtain samples of OSMF cases with co-existing OSCC. This would have been helpful to draw probable conclusions as to where and when myofibroblasts are first observed. Regarding the role of myofibroblasts as a prognostic marker, the present results showed that the expression of myofibroblasts showed a progressive and steady increase from early OSMF through moderate and advanced OSMF cases indicating that myofibroblasts could be used as an effective prognostic marker for disease progression in OSMF. Considering the observations of this study, and the role of myofibroblasts resulting in fibrosis and its role in tumorigenesis and tumor progression, therapeutic targets against myofibroblasts could be used to decrease the disease severity and prevent progression to OSCC. Sinor PN, Gupta PC, Murti PR, Bhonsle RB, Daftary DK, Mehta FS, et al. A case-control study of oral submucous fibrosis with special reference to the etiologic role of areca nut. J Oral Pathol Med 1990;19:94-8. Tsantoulis PK, Kastrinakis NG, Tourvas AD, Laskaris G, Gorgoulis VG. Advances in the biology of oral cancer. Oral Oncol 2007;43:523-34. Mithani SK, Mydlarz WK, Grumbine FL, Smith IM, Califano JA. Molecular genetics of premalignant oral lesions. Oral Dis 2007;13:126-33. Gupta MK, Mhaske S, Ragavendra R, Imtiyaz. Oral submucous fibrosis - Current Concepts in etiopathogenesis. Peoples J Sci Res 2008;1:39-44. Rajalalitha P, Vali S. Molecular pathogenesis of oral submucous fibrosis - A collagen metabolic disorder. J Oral Pathol Med 2005;34:321-8. Gabbiani G. The myofibroblast in wound healing and fibrocontractive diseases. J Pathol 2003;200:500-3. Liotta LA, Kohn EC. The microenvironment of the tumour-host interface. Nature 2001;411:375-9. Wynn TA. Cellular and molecular mechanisms of fibrosis. J Pathol 2008;214:199-210. Hinz B, Phan SH, Thannickal VJ, Galli A, Bochaton-Piallat ML, Gabbiani G. The myofibroblast: One function, multiple origins. Am J Pathol 2007;170:1807-16. Berman JJ, Henson DE. The precancers: Waiting for a classification. Hum Pathol 2003;34:833-4. Küffer R, Lombardi T. Premalignant lesions of the oral mucosa. A discussion about the place of oral intraepithelial neoplasia (OIN). Oral Oncol 2002;38:125-30. Angadi PV, Kale AD, Hallikerimath S. Evaluation of myofibroblasts in oral submucous fibrosis: Correlation with disease severity. J Oral Pathol Med 2011;40:208-13. Utsunomiya H, Tilakaratne WM, Oshiro K, Maruyama S, Suzuki M, Ida-Yonemochi H, et al. Extracellular matrix remodeling in oral submucous fibrosis: Its stage-specific modes revealed by immunohistochemistry and in situ hybridization. J Oral Pathol Med 2005;34:498-507. Radisky DC, Kenny PA, Bissell MJ. Fibrosis and cancer: Do myofibroblasts come also from epithelial cells via EMT? J Cell Biochem 2007;101:830-9.